What Are They, and Where Are They? Image: This is a radar image from Cassini of an island in the middle of a large lake on Jupiter's moon Titan. The island is about as big as Hawaii. Until Voyager reached the outer solar system we knew very little about the planets that inhabited this region of space. What we have discovered over years of exploration has both excited and mystified us. Come explore the science of the outer planets. Learn what we have already discovered, and discover what we have yet to learn. Looking for something specific? See the site map to find it quickly. Solar System Formation Find out how a fuzzy cloud of molecular gas formed the planetary system we call home. Giant Planets The gas giant planets are so different from the Earth. Find out the basics of their atmospheres and interiors. Moons There are more than 100 catalogued jovian moons, each with its own story about the formations of our solar system and insight into the existence of life. Rings All four jovian planets are surrounded by a set of rings. These rings are made up of rock, ice, and dust particles that range in size from microscopically small to the size of a house. Kuiper Belt Objects Poor Pluto... We still love you. Find out why Pluto was relegated to dwarf planet status and check out the other dwarf planets and comets in our solar system. Space Junk Made entirely of elements from the solar nebula, the asteroids and meteorites orbiting our Sun offer incredible insight into the origin of our solar system. Extrasolar Planets We have discovered many planets orbiting other stars in our galaxy. Find out how we do it and what we know about these extraterrestrial worlds. Missions There is no better way to study the outer reaches of our solar system than by sending a spacecraft to have a look. These 5 missions are some of the most informative and breathtaking yet. 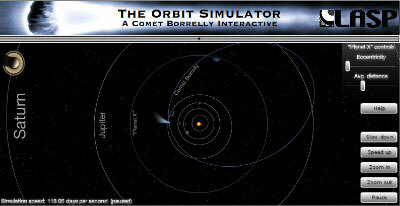 The Orbit Simulator shows the motion of the planets and other objects around the Sun. 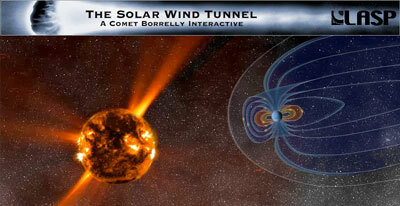 Use the Solar Wind Tunnel to explore how the sun affects magnetic fields, comets, and other orbiting bodies.